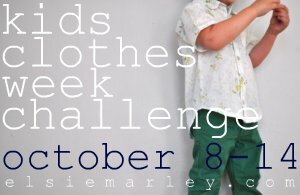 Starting tomorrow is the kids clothes week challenge over at Elsie Marley and I have decided it was time to partake after looking in from the sidelines for so long. As a lead in I thought I would share with you some of the kids clothes I have made in the past. I warn you some of these photos are certainly from my early photography days!!! I love making kids clothes cause they are usually very quick projects, cost little and kids are so appreciative that something was made just for them. I am planning my KCWC projects as I type this, I have cleared the dining table in anticipation (I should point out that I do actually have a whole room, complete with a horn sewing table and a proper drawing table, however, storage has taken over care of all my boxes that I had stored at my parents place, been delivered lol) and I did a quick trip for fabric this morning! Lets see what I can achieve in a week!